New York - Can Essential Oils Reverse Hair Loss? Can Essential Oils Reverse the Effects of Hair Loss? Hair loss is a condition that affects both men and women. This condition has a number of causes and may be a reaction to hormonal changes, stress, or genetics. At True & Dorin, our hair loss doctors offer a wide range of hair loss treatments to restore volume to thinning, balding patients. These treatments vary and are suited to patients based on the type of hair loss suffered, the cause of hair loss, and the desires and expectations that patients have regarding hair treatment. Recently, there has been a renewed interest in natural treatments and essential oils. As such, we have been asked by many of our patients, “Can essential oils reverse the effects of hair loss?” Here we discuss how effective essential oils can be for patients who have experienced hair loss or thinning. Are Essential Oils Effective on Hair Loss? Combined with a vegetable-based oil (known as a carrier oil), these oils can stimulate hair follicles and improve circulation to the scalp. While some studies show that, after consistent use over several months, some patients did show an improvement in hair growth, patients should not expect dramatic results from essential oils treatment. 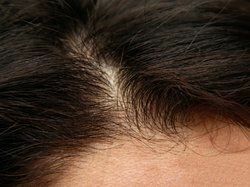 This natural treatment requires dedication to a repetitive practice and, with consistency, may slow down hair loss, and in some cases, promote hair growth. Those who are advocates of essential oils treatment for hair loss stress that consistency is key and also advise changes to lifestyle and diet habits to maximize results. While essential oils may be right for some, at True & Dorin we offer a wide range of hair loss treatments that have been proven to increase hair volume, fill in receding hair lines and bald patches, and reverse the effects of hair loss. Depending on what has caused hair loss and what type of results our patients desire, we may recommend anything from medicinal treatment to a hair transplant procedure. For patients who are looking for dramatic and effective results, our hair loss treatments can create the thick head of hair they desire. If you are bothered by a thinning hair line and are looking for real, effective hair loss solutions, schedule an appointment with the hair loss doctors at True & Dorin. We can recommend a treatment that is suited to your unique needs and desires in order to get you optimal results for hair loss treatment. We look forward to hearing from you!